Brook Lodge is a luxury 5 AA star self-catering lodge near Wakes Colne, a village in the breath-taking Colne Valley on the Essex and Suffolk border. But the real playground is the 500 acres of private grounds with woodlands and two acre fishing lake stocked with carp and rudd. A haven for birdwatchers and nature lovers, you may even catch a glimpse of a kingfisher. Your furry friends will love it too – the woods with its little stream are pooch perfect for sniffing and moseying about in. Set at the end of a mile long private driveway, our bolthole for a cosy couple is tucked away in an ancient meadow in undulating countryside, where in decades gone by heavy horses, cattle and sheep would have grazed. Five-star is par for the course at Brook Lodge. Beautifully decorated and spacious, you’ll be wowed as soon as you open the front door. The state of the art lodge boasts the very best of open plan living. Cook up a storm in the fully equipped kitchen, watch Netfiix on the bespoke sofas and enjoy the latest technology. Sleep like kings and queens in the sumptuous bedroom. The spacious en suite bathroom has an enormous tub and its shower is walk in heaven. Flip open the French doors, let in a breeze and toast the wonderful views across the lake and the open countryside. 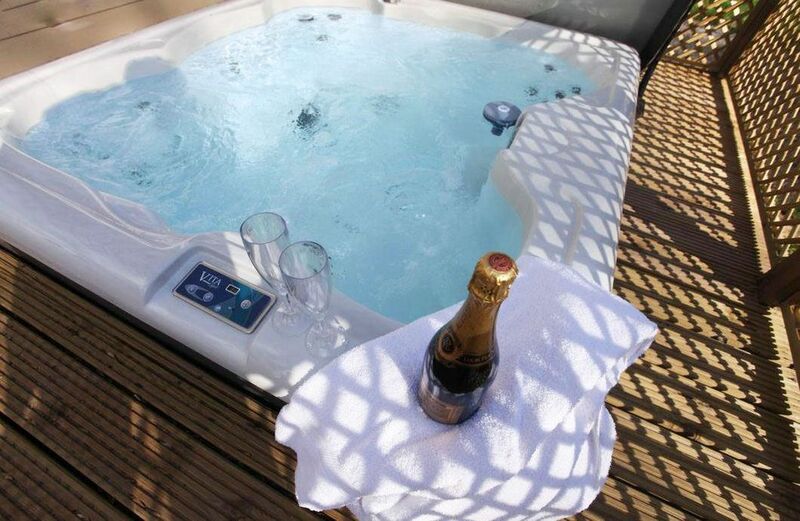 Make the most of the inviting hot tub on the south facing veranda. A great treat after a long day exploring the Essex countryside. Access to 500 acres including a two acre fishing lake and woodland. Master bedroom with a 6′ bed and an en suite bathroom with a free standing bath and walk-in waterfall shower. WC cloakroom adjacent to the hallway. There is a gate to the entrance of the decked area which can be closed to keep dogs in. Our New England style lodge has the very best of open plan living, with an impeccable layout, interior furnishings and attention to detail. The lodges are nicely spaced apart with small plantations of trees and shrubs in between, so guests’ privacy is always maintained even if each lodge is occupied. Wakes Hall Lodges have been awarded a prestigious five-star AA award and ‘Best Self Catering Facility in Essex’ at the Essex Tourism and Hospitality Awards in 2015. Luxury living in the midst of a tranquil rural setting with a private south-facing veranda with hot tub and outstanding countryside views. The ground floor accommodation is suitable for guests with reduced mobility – both doorways, shower rooms and pathways are accessible for wheelchair users. The lodge has been specially designed to be carbon neutral and, thanks to its eco design keep visitors snug during the winter months. Short and midweek breaks are available, with a minimum stay of 3 nights. A perfect getaway at any time of the year, there is always plenty of wildlife to see and multiple beautiful country and woodland walks are available to explore from your doorstep. A tranquil, peaceful location, yet just one mile from Wakes Colne and Chappel with a convenience store and excellent dog friendly pub, The Swan. Wakes Hall Lodges are within 60 minutes by train from London/Liverpool Street. En suite bathroom to master bedroom with a free standing bath and walk-in waterfall shower. No smoking Up to three well behaved dogs welcome. Please do not allow your pets on the furniture. * One pet is £25/stay, two pets is £35/stay, three pets is £50/stay £100 security deposit is added to the booking cost. If dogs are included in the booking the deposit required will be £200 Minimum stay 3 nights Check-in is after 4PM Waitrose delivers to the lodge if you wish to book an online delivery The welcome hamper includes a cake, cookies, milk, wine and the most delicious apple juice Enjoy your stay, thank you! Although you’ll feel completely disconnected from the rest of the world, the wealth of attractions on your doorstep will leave you spoilt for choice. Brook Lodge is just a stone’s throw from the historical viaduct at Chappel where there is a shop and post office and a picturesque pub beside the River Colne that serves locally brewed beer. A 20 minute drive takes you to Britain’s oldest recorded town, Colchester which offers a wide range of activities for all ages, from Colchester Zoo to the Roman Castle. The world-renowned Constable country is within a 30 minute drive, where you can take a visit to Dedham Vale, an Area of Outstanding Natural Beauty, home of Flatford Mills, made famous by John Constable’s painting, The Haywain. The beautiful village of Coggeshall just 12 minutes’ away, is steeped in history and the back drop to many television series including Lovejoy. Expect lots of museums, stately homes and gardens. Highlights include the Gainsborough House museum and art gallery in Sudbury, Marks Hall Gardens & Arboretum, The Beth Chatto Gardens, Melford Hall and Kentwell Hall. All are within half an hour’s drive. Within a 10 minute drive is the Earls Colne Golf & Country Club together with numerous other golf courses located within a short driving distance. So, whether you’re celebrating a special occasion, or just fancy a few days away from the hustle and bustle, why not unwind at Brook Lodge in the tranquil beauty of the Colne Valley?